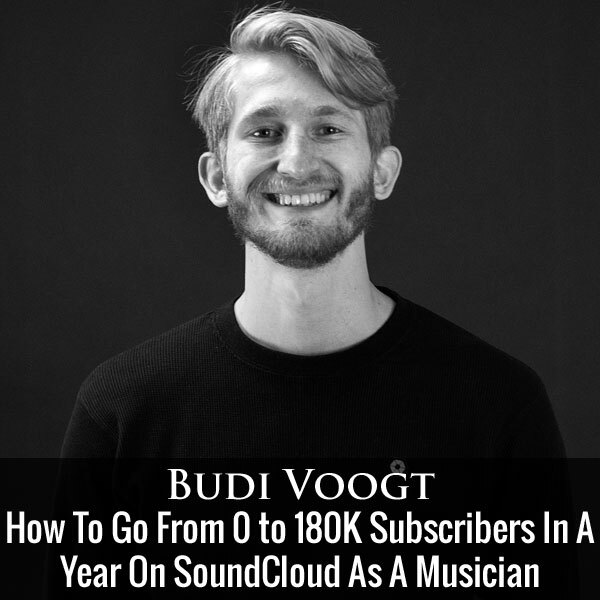 Budi Voogt is the co-founder of Heroic Recordings, a record label group and agency that represents a number of major electronic artists. He is also the author of the SoundCloud Bible. Now I have a lot of listeners who are artists and some are even musicians. So I brought Budi on the show today to teach us how to become a successful solo entrepreneur and leverage your artistic talents as a business. Now if you enjoy this podcast please leave me a review on iTunes, and if you want to learn how to start your own online business be sure to sign up for my free six-day mini course, where I show you how my wife and I managed to make over 100k in profit in our first year of business. Go to www.mywifequitherjob.com sign up right there on the front page, and I’ll send you the mini course right away via email, now onto the show. Steve: Welcome to the My Wife Quit Her Job Podcast. Today I’m happy to have Budi Voogt on the show. Now Budi is the co-founder of Heroic Recordings, a record label group, an agency that represents a number of major electronic artists. He’s also the author of the Soundcloud Bible. And here’s just a quick aside before we begin. You know, when I was young, I was somewhat discouraged by my parents to kind of pursue any career in the arts not that I was any good at the arts, but being a professional artists carries kind of a negative connotation about being poor in starting. Now I have a lot of listeners who are artists and some are even musicians. So I brought Budi on the show today to kind of teach us how to become a successful solo entrepreneur and kind of leverage our artistic talents as a business. So with that, welcome to the show Budi. How are you doing today man? Budi: Doing very good. Thank you for having me Steve. Steve: Yes so give us the quick background story. I actually know very little about the music industry. So how did you start Heroic Recordings, and basically can you explain what a record label is and what an agency does? Budi: Sure, absolutely, so to give a quick random for the listeners. So basically Heroic is a record label group and agency. And what we do is very much focused on the electronic music. And we try it on the web. What we do is we have a number of record labels which serve for us as a platform to discover and kick start upcoming talents. So that might be we discover them on Soundcloud or elsewhere, or they were tipped off to us. And then we release their records, we market them with a heavy emphasis on online, so blogs, YouTube channels, Soundcloud channels. And from there we pick out the artist with the most potential and from our agency division, we then represent them for management to really build careers. So to give you an illustration, one of the artists we brought from 2,000 followers to like 180,000 taking him from guitar teacher to fully—yeah, he is self sustaining as an artist right now touring the world. Steve: That’s cool. So actually how did you actually get into this business in the first place? Are you an artist yourself? Steve: So how did you actually start Heroic? Budi: Right, so I was in business administration. I do my bachelors in a university here in the Netherlands. And this was about four and a half years ago when I started. And I always had an entrepreneurial itch, but I didn’t know so much what I wanted to do yet. So I’d chosen this university direction because it was the closest approximation to doing business, right business administration. I was going to the local chamber of commerce following a number of workshops about entrepreneurships and trying to figure out how they worked. At the time my best friend started producing music and they put a track on Soundcloud which at the time was at its infancy. And in one or two weeks time, it got 10 to 20 thousand plays which back in the day meant that they were like the top 1% people on the platform. It was surprisingly good how well the response was. And mind you this was without any following. This was super organic. It was sort of like the stars aligning. So we came together and it was guys there’s some great opportunity here. They started an act. I started managing them. These were really the beginnings. It was a great way for us to start finding our way and also a great opportunity to start running a business, and from there it very much escalated. Steve: That’s interesting. So you were the author of the Soundcloud Bible. So is that primarily how you promote your artists? Budi: No, absolutely not. It is just a part of a spectrum of things that we do. You see, how the Soundcloud Bible comes in here is that to pick up where we left off. So when I started managing these guys, soon enough I discovered how much I loved doing that. So I started an agency with my partner, started signing more acts and then at one point we realized like, hey we are trying to open all these doors of all these established players, managers, publishers, really the established, you would say elite, but it’s rather just that the music business model was very much focused around these bigger companies that grew back when physical still was the driving product. Steve: Okay, so you guys were like a one stop shop at this point so to speak. Steve: So a couple of things I just want to get clear since I know very little about the music industry. So what is a record label first of all? Budi: Right, so originally a record label where the name comes from is from the sticker that people would put on a vinyl record, because vinyl all look the same. It was wax and then you would put on the sticker and that would be the brand, so hence record label. Now that meant typically that the record label has the role of discovering the talent, and then both financing and facilitating the production of records and then that will be sent to a distributor and the distributor will distribute it at the stores. And now we essentially do exactly the same, but then instead playing the physical level, we do this on a digital level. So we discover talents, we sign them, we curate it. We make sure the product and the artist is in the best shape possible. We might finance it. We might make sure that there’s correct branding visual, aesthetics, artwork etcetera, and then it goes to the distributor and then the distributor brings it to our stores which we call DSPs digital service providers. These are your iTunes, Spotify etcetera. And from there the tracks are available for sale and this is only the beginning. The real work comes when you are doing marketing. That is pretty much what a record label does. So everything I just told you is the foundation where you really excel is your musical curation, your visual presentation and then especially your marketing. Steve: So I’m just curious, and I’ve always been wondering about how this all work. So how do musical artists typically get paid? So is it by the play, do they make most of their money doing concerts and live things, live events? How does that work? Budi: Right, very good question and one where the answer has sort of shifted over time. In say 15 years ago, 1998 the record industry was a $30 billion dollar yearly grossing industry where as now, 15 years later, it’s about $15 billion. So the industry is effectively halved. And the reason why that happened is because with the decline of physical, and with the rise of digital, you would got sort of a democratization of distribution and everyone is opting now for accessibility and comfort instead of ownership. People want to have access instead of wanting to own that CD or vinyl. And what’s happened in the process is that all those, those larger [inaudible 0:09:26], think about $12 for a CD which effectively now is someone just rings a track on Spotify and that one play might make an artist 0.056 cents. Yeah, so the game is very much changed. So right now the majority of a touring artist his revenue might be events like performances. But, there are many artists still who are able to make a living off of royalties, and that means income from download sales, CD purchases. Steve: Just curious, so people still buy CDs? Budi: Some, yes. However I think this is very dependent on genre. For example we are very much focused on electronic music making our demographic very young, and thus physical consumption is nonexistent. But maybe if you are making country music, there is a larger portion of people that still do. Steve: Yeah, I mean, I can’t remember the last time I actually purchased an album. These days, I just use Pandora, Spotify, and I’ll buy an occasional track here and there. So the artists are they—you mentioned it was somewhere like 0.001 cents per play like on Spotify. So that kind of implies that you have to really still hit it big in order to make a living doing this. Is that accurate? Budi: Absolutely. I think there are many artists though who very successfully manage to create the sort of a synergy of revenue streams. So you would have some licensing for example you put a track behind advertisements or video replacement. You might have some breakable royalties via downloads and streaming. You might play a few shows and all that together might come to [inaudible 0:11:18] income. Steve: Okay, I’ve always been curious about how copyrights and all the rights to music works. So when an artist produces something, they own that sound right, and so they have to get contacted if anyone wants to use their music in a video or something? Budi: Yeah, music copyright is very, very complex. But if I were to summarize, there are two major copyrights for everyone’s understanding. So basically via international law, if you create something that is a unique idea whether that’s a song or actually an idea or a device or whatever and you can, you break down that idea, or you store it in such a way that it can be reproduced by someone else, then technically you have copyright on that thoughts. Now, on music it means there are two different entities if you need to separate between. And number one is the song, the composition. And this is easiest to interpret as a sheet music for example. You know if you look at sheet music, there’s all these notes and the notes together make the arrangement that is the song. Budi: You are still with me Steve? Steve: Yeah, I’m still with you, yeah. Budi: Okay beautiful. So a good point to visualize that would be to think about sheet music. And then you have all these notes switched together form the arrangement of the song. And that is one copyright. That is the composition copyright on the song. That is owned by the songwriter. And then another copyright is the copyright on the actual recording of that song. So you might have person A write the song and you might person B perform the song. And then you might have person C record the performance of person B.
Steve: Okay, wow, so if I were to use just this is a random aside, if I were to use like a piece of music in one of my YouTube videos, it sounds like I have to contact several people. Budi: Yeah, so basically different—absolutely. It’s going to be super confusing for people, but usually what that means is that if you were to use a track then technically you would have to reach out to the master owner. And the master owner would either be the record label or the person performing the song. Steve: So I’m just curious Budi, so what—how did you get your first clients and why would they go to you as opposed to like a larger record label, like a Sony or [inaudible 0:13:47] or whatever? Budi: Right, so our first clients very much came from our close environment. So basically my initial act were my best friends and from there they were doing a great job and other people saw I was doing a good job, and this allowed me to find other talent and they were seeing that I was making things happen for these other guys. So that was the initial growth. And now very much what you see is a compounding effect. So the bigger the label gets, the more music submissions we get, the more easier it is to find artists. And on the agency side as well, like the artist I just named San Holo. We took him from 2,000 to 180,000 fans, right? He’s going to do three international towards the end of the year. And I think what allowed us to for example work with him is that we recognized potential where other people didn’t, and then we executed so precisely that we actually managed to capitalize on the opportunity that was there whilst other people passed on it or didn’t know it was there. Steve: So assuming that a large record label had noticed him, what would have been the advantage that your firm had over much larger player would have? Budi: A larger player would never have signed him simply because the track record would not have been there, so they couldn’t have justified the investment. Steve: I see. Okay, okay that makes sense. So let’s go into some of the details. You mentioned, is it Han Solo? Budi: San Holo, it’s a word play. Steve: Right. So let’s say for example that I was a musician. What would be some of my first steps on getting the word out there? So a client goes to you for help. What are some of the first things that you do to kind of promote the musician? Budi: Right, okay, so whenever I talk about marketing for music, I always try to make it very clear that the foundation for correct marketing needs to be there. So if your music and your visuals are not up to par, then it’s a futile effort to be pushing the act in itself. So step one is always, you got to make sure the music is up to par and a guideline we use for that is you take the three best current acts in a similar sound as the actor trying to push, you compare their three best records to yours, and if your stuff doesn’t come 80% close, you go back to the drawing board and you improve, and you improve and you improve until you are there. So that’s step one. Step two would be making sure that you have a very strong and coherent visual aesthetic, your look. And ideally you want to have a look that is an extension of your musical style and you want to make sure that you extend that across all your channels. So your Facebook, your Twitter, your website, everywhere. So that someone would see your track, or the art work cover and they would know what band you are, and they might see your Facebook and have the same effect on your art work. Steve: So you mentioned a bunch of social media platforms on there. Is there a particular one that a lot of musicians look at or use? Budi: Yeah, that would be Soundcloud. Budi: However I feel that there’s a selection that are essential to be on right now, like that an artist simply couldn’t do without. And that would be Facebook, Twitter, YouTube, Soundcloud, Instagram, increasingly more so and more recently also Snapchat and Vine are becoming very popular. And now, at least the ones I mentioned are important to be on simply because there’s going to be fans there looking for you if you are building a name, and if you are not there, you are going to lose a lot of listeners or fans or subscribers. Steve: Interesting. So in my experience, when you try to be good at a lot of different social media platforms, you end up not doing a good job with any. So if there’s any that you would focus on in the beginning, it sounds like you would focus on Soundcloud, or in terms of social media, what would you be focusing on? Budi: Right, okay. So there’s something that we call the funnel theory. And that’s basically, if you are an artist, and this goes beyond music by the way. I’m sure you’ve of the super fan theory. Steve: Yeah, once you explain that for the listeners. Budi: Yeah, basically a super fan would be someone who is so committed to your brand whatever it is that you are doing that they would tell their friends about you, that they would go out of their way to support you, that they would be willing to give you their money. And super fans is what every brand and business are trying to create even if it’s clients. You want to do such a good job that that person then goes on and tell someone else how good of a job you did so that you get more business. And now in music, I think that social media is very much a funnel. So most important for a musician might be the content [inaudible 0:18:50] ones. So YouTube and Soundcloud, because the people who go there, don’t go to see people’s status updates, but they go to consume media and then Soundcloud is most centric to music. So there’s highest value there, then followed by YouTube where people go to watch videos or to listen to music. And then from there you might have a play, and a play might convert into a follow on YouTube or Soundcloud, and then those people might click through to your Facebook, or your Twitter or your Instagram, and then they might follow you there. Steve: What is your definition of a conversion? Are you gathering email addresses, are you getting subscribers? What is your definition? Budi: All of them are conversions. Budi: Yes. However, there are some we value more than others. For example for a musician 10,000 Facebook likes will never do for you what 10,000 Soundcloud fans will. Budi: Both in terms of — sorry go ahead. Steve: No I was going to say let’s talk about Soundcloud a little bit, because I don’t have a complete understanding about how the platform works. I do know that I had considered hosting my podcast on Soundcloud at some point. But is it basically — you mentioned earlier when we were talking pre-interview that it’s like a YouTube. So is it mainly for musicians or is it for podcasters as well, because I know a lot of podcasts — a lot of my listeners actually have their own podcast as well. Budi: It is absolutely for podcasters too. Steve: Okay and so what are some good strategies involved in building a following on Soundcloud? Budi: Right, so I think one thing that’s important for people to understand is how quickly Soundcloud is growing. So they reported about 2.5 billion monthly plays last year June I think. And then this year in May they recorded 5 billion monthly plays, so that’s a huge growth rate. And more and more so the consumption is going far beyond just music listeners, comedians are on there, podcast etcetera, so I would absolutely recommend. Now when you are starting on a platform, there are a few basic things, so number one would be start realizing your profile, making sure it’s cool here and tweet the rest of your brand. But then when you do that the most important beginner tip would be to make sure that you make correct use of the tax. So similar like a YouTube, Soundcloud has a chatting system which can be found if you land on the webpage, you can go to the explore tab, and there’s a drop down list of categories. And among those are a few for podcast, and now what you want to do when you upload a track or a podcast, is you want to make sure that you not only put in the actual title and maybe some related podcasts, but you also want to put in the specific name of digital category that you want to be indexed in. Because then when you get plays you will have a much higher probability of being indexed. Steve: I see, categorized essentially is what you mean? Budi: Yes, but then indexed in one of the charts. Steve: Oh, okay got it okay. So Soundcloud — so how does discovery work on Soundcloud, it’s basically based on search results based on these charts, how does it work? Budi: Right, so a lot of it is community driven. So many people have the Soundcloud accounts and whether they are content creators or just consumers or listeners. People go in Soundcloud, they follow accounts, and you will have a feed similar to a Facebook feed. And the feed will show in chronological order of the uploads and the reposts. A repost is basically a re-tweet, but then on Soundcloud, of all their other people they follow. So it’s very much like a digest. Steve: Interesting, how does Soundcloud compare to like a Stitcher radio for example? Steve: Or iTunes for that matter. Budi: Right iTunes is a store, much more so than a community. And the only reason why podcasts thrive on iTunes is because iTunes is so well adopted right. Like everyone has their credit card hooked up to iTunes, and a lot of people have a Smartphone. So it’s very easy to want to be accessible there as a podcast. But I think what iTunes lacks is the community aspect, so you might have people that review a podcast right, or a track that you will never get people commenting asking you maybe 27 minutes in this interview when you publicize it, like hey, I would love to know more about this specific copy, and for you then to be able to jump in there and send someone a link. Steve: Interesting, okay, yeah clearly I need to explore this Soundcloud platform a lot more. So you would have your musicians start on Soundcloud and do some of the procedures that you just mentioned. What are some of the kind of the next steps to gain traction? So let’s say your content is good, your art work is good. What are some of the next steps? Steve: What frequency do you recommend? Budi: One track between four to six weeks. Steve: Oh, okay, that’s not that often, so 12 tracks a year? Budi: Yes, however for example with San Holo we did 19 tracks on one year. Budi: So that is a lot and I know that many creatives have a very hard time keeping up with that pace. Steve: Is there any techniques to just quickly accelerate the subscriber process on Soundcloud? Budi: Well it’s the same as this traditional marketing that’s really a variety of things you can do. So number one means — would be making sure that you tie correctly. Number two would be finding a group of relevant artists or pace makers in your niche, and then connecting with them and committing to reposting each other’s work. So let’s say they are five people with 10,000 subscribers, then if everyone reposts each other’s uploads then you will have a collective reach of 50,000 subscribers. Steve: And was that your strategy with—I have an [inaudible 00:26:06] is it San Holo? Steve: So was that your strategy, I mean you went from 20,000 to 180,000, what is it like a year you said? Steve: Yeah, so that type of exponential growth would not be from just tagging your music properly, right? Budi: No, these are 20 factors coming together. Steve: Yeah, so let’s talk about some of these, the major ones that contributed to this growth yeah. Budi: So this reposting that I was explaining is super important, so it would be finding the pace makers in your niche, building relationships with them, and getting them to repost your material when it comes out. Steve: What is their incentive for reposting your material? Budi: Having good content, however if you do this properly right, you actually create a proper incentive. So it might be that you repost their stuff as well as a sort of a given tag. It might also be that there are many promotional channels, so for example on Soundcloud there’s channels who do nothing else but plays music in specific genres. So you might reach out to those people and say, hey listen I would love it if you guys pre-post this track and then you could upload it as well. And then they have content for their channel when you get exposure. Budi: Now you can build upon that by also getting blogs to cover your release, and this is very-very essential. And blogs nowadays especially music blogs what they do is around 95% of them, they all embed Soundcloud players on their articles. So if you have for example new release come out, you might structure a bunch of reposts to happen within the first week of release. You might also structure a few blogs to write about it embedding the Soundcloud link. You might have then tagged it correctly, you might have done — made sure to also have reached out to some YouTube channels who promote music, I’m not sure if you are familiar with the concept. Steve: No actually can you go over in more specifics on what you say when you reach out to the blogs or the YouTube channel owners. Budi: Yeah, so we have a framework for this, and it comes down to the business basics they teach you. Number one is figure out who the people behind the entities are right? It might be this huge blog, but at the end of the day you are trying to reach out to the one person who write the article. Just like you if you are trying to get hired right, you might — yeah you are trying to find the one person who is in charge of HR or hiring. Budi: And then you try and build a relationship based on mutual interest, based on mutual values, maybe something you can do for them. Maybe you can tape off a good artist; maybe you can make sure that your music is perfectly pre-selected. So our crafts — sorry I just got a face on call going straight through this. Let me restart this yeah. Steve: Yeah, you just keep going I’ll just set it out. Budi: Yeah, one second. Okay, I mean I’m not sure if it’s possible to mute that actually. Steve: It’s okay, I’ll just cut it all out don’t worry about it, just keep going. Budi: Okay, beautiful let me reiterate the answer. Okay, so blogs yes, so this comes back to the art of pitching. And this is very much the same skill that you are going to need in life and in business in general. And what we are trying to do first is we deconstruct who the relevant people are behind the entities. So you want to find the writer at the blog, you want to find the founder of that YouTube channel. And then what you do is you are trying to connect with them on a personal level, so that might mean we might add them on Facebook and have a real conversation with them before asking for anything. Or it might mean that we send them an email and tape them some music. And then when it comes to the actual pitching, we make sure that it’s perfectly crafted. Like we would never pitch music to someone if we weren’t 100% sure that they’re actually are going to cover it. Steve: Okay, by then you are 100% sure because you’ve already had a few conversations none business related prior. Budi: Yes, we absolutely try and do that. And sometimes there are scenarios where that’s not the case, because you can’t potentially reach everyone. But then still when you pitch you want to make sure that they overly probably support your stuff. There’s no reason to pitch if you don’t think they’ll write about it. And you only get so many shots with these people. Typically your first impression is the only impression. Steve: Okay, I mean this is a lot just like online marketing in general, right? Steve: Yeah, find the people who matter or who can help you and then reach out. Do you end up going to conferences? Are there music conferences and what not where you can actually meet a lot of these people live? Is that part of your a strategy as well? Budi: Definitely. There’s actually a very big one coming up called Amsterdam dance event. This is where all the people in dance music come together from around the world. You are talking ten meetings a day for five weeks straight, for five days straight. Steve: Okay. But you’ve mentioned Soundcloud, a bunch of other social media platforms. I was also just kind of curious; those are platforms that you do not own. At any point does your own personal branded website or own properties come into play here? Budi: Absolutely. Internet marketing like you said. So at the bottom of the funnel, the things that we would value most would be visitors on an entity you control. So that would be our website. Also we are very big on the email marketing and building an email list. Steve: Okay, and what are some of the incentives for someone to sign up for an email list that you guys employ? Budi: It would be free tracks, it would exclusives. So free compilation, get a track before it comes out. Exclusive remix to email subscribers. It could be get notifications when we have a show. It could be– we recently did this with San Holo. We actually did a very unique video clip concept, where we worked together with a bunch of amazing directors and editors. What they did is that we made a clip where everything takes place just on San’s computer screen. And then throughout the clip, we actually played some fan footage on his computer and that was inside the video. So to gather that footage, we reached out to the fans. It was like, “Guys please send over whatever photo or image material or video material you have of live shows.” And they send it in with bunches and a few of them were actually included in the video. Steve: All of this actually that you are describing, it sounds a little pricy to get these videos professionally made, to get your sound recorded at a professional level. What I think of musicians and artist, I think that they tend to be very poor. Is it just a service that you provide as being the record label, or can any solo artist kind of afford to do these things? Budi: Absolutely. I think if you exclude this video clip with a bunch of directors from this equation, then you can get a good visual aesthetic. You can set up your socials. You can build a website without knowing how to code. You can buy a microphone for 100 bucks and record yourself. You can distribute to all the stores using TuneCore. I mean the real variable here is effort. Steve: Okay, no it just sounds like if I can kind of summarize your strategies, is put yourself out there on platforms where there is larger audiences and communities, gain a following, somehow lead them back to your site where you can actually get them on to your list, and you want to be establishing raving fans that will follow you wherever you go. Is that kind of an accurate summary? Budi: That is a part of it. I think the missing variable here is the following. So this model that I’m explaining here is very much a model that we’ve used to go from no track record, no money, no followers, into actually making a living off music, both on the label side but also for our artist. And we do that indeed by building a following on social platforms, but then the crucial variable here is that we use that following to actually leverage deals. So for example, San blew up on Soundcloud and at the time he was working as a guitar teacher. And we were bootstrapping everything. It was just us at the record label, working a lot of hours, and him making a lot of music and a friend of ours doing the visuals. And from there we turned that around into finding three, no four actually booking agents worldwide and going to a big record label and negotiating a good deal, which in turn gave us a budget to start producing bigger things. So we very much took what we didn’t need any financing to do, and then we started leveraging those numbers and the social hype into more tangible and maybe in the business sense more and more financially funded situations. Steve: So what was that deal with the major label? What was it for? Budi: Yes, so this was not with a major label, but rather with a larger label. And with San and all of our artists actually, we are very hesitant on doing exclusive deals. So we typically work on a basis where we might do one or two releases or an EP with a specific label. And now we’ve had the opportunity of working with a number of very cool labels over this year. But more recently we’ve done a release on Spinnin which you may know. Budi: Right, they are the label who broke Martin Garrix who you might know. Steve: So it sounds like once you have the following, everything kind of starts falling into place. What are some monetization models that artists have once they have a certain following? What would you say would be kind of like the minimum threshold? Budi: Right, so I’m sure you are familiar with a thousand true fans. Yes. So I think that concept is very good. When you look at the follow a thousand fans will probably be not enough to have a thousand true fans, right? Budi: So you will probably need somewhere between 50,000 and 100,000 collective fans on your socials like in aggregate before you can really make a living off music. Steve: Okay, and then what are some of the—when you are smaller, what are some of the primarily monetization models. Steve: What is the revenue percentage for a platform like that, TuneCore? Budi: For TuneCore? In that case you are actually fulfilling your roles of distributor yourself as a record label would do. And iTunes for example is typically a dollar for a single. So then after covering your costs for having that single up on all the stores for a year, you would put almost 95 cents out of that dollar in your pocket. Budi: No, no it’s not. So if you keep full control of everything, if you go fully in, then technically you can start making those small revenue streams. Steve: Okay, I didn’t realize you get to keep 95% assuming you control everything. Budi: Yeah, you can actually on TuneCore; you can keep 100% if you just pay a yearly fee, a flat fee to get the stuff up. Steve: Sorry, I interrupted you. You can go on. Budi: So one side of it is distribution, just selling your stuff on stores. Another aspect would be monetizing your YouTube and Soundcloud accounts. And [inaudible 0:38:56] not a lot of money here. We are talking about 2,000 plays to a dollar. Steve: Oh wow. That’s really bad actually. Budi: Yeah it is. But it’s another thing you can do with reasonably little effort, right? Budi: So you would go to a multichannel network, and we work very closely with a couple of guys in Canada who do amazing things called The District. Steve: Sorry, not familiar. What is that? Budi: It is a multichannel network. Budi: Basically they represent YouTube channels and Soundcloud channels. If you are an artist with a following, then you can reach out to them and make sure you start monetizing your accounts and your content. Steve: Is it going to be the same approximate payout of 2,000 downloads for a dollar. Budi: Yeah. So Soundcloud is a little bit worse, but for YouTube absolutely. And then there’s another revenue stream called Content ID which is basically monetizing other people using your music on their videos on YouTube. Steve: I see, okay, that makes sense. Budi: So there is another revenue stream, and then of course you have public performance, so signing up to the [inaudible 00:40:09] and their sound exchange if your track is going to get played then on the radio or on TV, then you get public performance royalties. Steve: Okay, what are the logistics in doing these performances is there a larger upfront investment? Budi: How do you mean these performances? Steve: Well, let’s say I wanted to perform at a venue near my house; wouldn’t I have to reserve all that stuff, put a lot of upfront money down, sell tickets and that sort of thing? Budi: Very much depends on your set up, so for example we work with electronic artists right, DJs. So for us it means playing a show that’s technically one of them bringing up USB stick to the club to play itself. Steve: Okay, I guess in your case that would be the case, I was just thinking of like — think even more like a conference right? You have to kind of book the venues and all that stuff and then start selling tickets right? Budi: Yes, so to give you some insights, so basically these are all — this whole process is fulfilled by people doing different roles in the music industry. So you have the people who control the venues, these are typically called either the venue owners or the promoters. And the promoters are the people who organize the events. They typically finance it, they typically make sure that there is art work made, they book the act, and then they sell the show and make a profit off tickets. Budi: Now the artist might be booked by a promoter, and then the artist might have a booking agent, and the booking agent might negotiate a reasonable fee for that artist to be paid by the promoter. Steve: Okay, it sounds like there’s a lot of different players here in the process, that they are kind of like intermediaries artist might need to have right? You mentioned a booking agent, a record label, and so are all these things kind of required if you are just starting out? Budi: Absolutely not, I think just like with anything that once you reach a certain point there will come a certain time where you need to involve other people if you want to scale. So you can 100% book shows yourself and play and make some money. But of course once you start creating a following for yourself, you might find a booking agent who is super enthusiastic about what you are doing. And then that booking agent even though he takes a commission might help you make more money than you would if you were fully independent still. Steve: Okay, yeah, I mean this sounds a lot like running an online business to be honest with you. Yeah, there’s definitely a lot of parallels. Hey one last question for you then, I want to be respectful of your time, we’ve already been talking for 40 minutes. I was just curious how does Vevo work, like whenever I’m on YouTube and I’m kind of watching a video, I always see Vevo right? Budi: Yeah, so from my understanding and I’m going out of my depth here, Vevo is the collective YouTube channel from the major labels. And now the major labels right now, there used to be more are Sony, Universal and Warner, and I think what they did is they paired together to create a big YouTube channel where they put all the prime artists, so that collectively they would have the bigger audience instead of separating that and compartmentalizing. So that’s why you see a Katy Perry uploaded track on Vevo instead of her own accounts, because that’s a major label pushing it on the biggest YouTube platform they have. Steve: I see, okay, that makes sense. Hey Budi I want to be respectful of your time, and thanks a lot for coming on. If anyone wants to locate you or get a hold of you, or if there’s any musicians out there listening to this podcast, where can they get a hold of you? Budi: Okay, so you can find on record label on heroicrecordings.com. And there you could find our different imprints and also the artists who you manage for. Now I write about my experiences on my blog which is budivoogt.com. And from there you could also click through to my book the Soundcloud Bible, and my new music marketing academy video course. Steve: Awesome, well, hey Budi thanks a lot for coming to the show man, I learned a lot about the music industry. I had no idea how anything worked prior to talking to you. Budi: Beautiful, thank you Steve, I appreciate your time and the opportunity. Hope you enjoyed that episode, I have actually often wondered why musicians are often poor, and I had no idea how the music industry worked until today. Thanks to the internet any musician has a chance to make it big without going with one of the large record labels and I love it. For more information about this episode go to mywifequitherjob.com/episode 97, and if you enjoyed this episode, please go to iTunes and leave me a review. This is by far the best way to support the show and please tell your friends because the greatest compliment that you can give me is to write a referral to someone else, either in person or to share it on the web. Now if you are interested in starting your own online business, be sure to sign up for my free six day mini course where I show you how my wife and I managed to make over 100K in profit in our first year of business. Go to mywifequitherjob.com, sign up right there on the front page, and I’ll send you the email course right away. Thanks for listening.